As the bridge between old and new Vegas situated in the heart of the Las Vegas Strip, Bally’s offers its guests convenience and class with a central location and well-suited amenities. Towering neon columns, 200-foot people movers and cascading fountains entice guests inside the landmark resort. With the bevy of dining, shopping, meeting and entertainment options, there’s no reason to leave in a hurry. But those who desire can easily stroll back and forth between Bally’s and Paris Las Vegas next door through the Le Boulevard shopping and dining area, or catch the Las Vegas Monorail to one of many locations on the Strip or to the Las Vegas Convention Center. Entertainment options at the resort include the mind-reading magic of “Paranormal.” Adults will enjoy “50 Shades! The Parody” based on the best-selling “Fifty Shades of Grey” trilogy. Most of Bally’s fine dining options are located in a corner hallway just off the casino floor, creating a tempting and relaxing restaurant row. Sea – The Thai Experience is a sleek, Bangkok-inspired restaurant featuring Thai fusion cuisine. BLT Steak, which is renowned in New York City, combines a bistro ambiance with classic steakhouse fare. In addition to its weekly blackboard specials, BLT Steak is best known for its signature warm popovers, specialty steaks and fresh seafood. On weekend afternoons, BLT Steak transforms to offer the Sterling Brunch with its over-the-top indulgent cuisine, tuxedoed waiters and bottomless champagne. Casual fare can be found at the Italian eatery Buca Cafe Italiano, Tequila Taqueria, Nosh and Lavazza as well as in the food court, which features Johnny Rockets, Nathan’s Famous, Pan Asian Express, Sbarro and Subway. In the evenings, the intimate Indigo Lounge keep the action going with live music and signature cocktails. Both business and leisure travelers will find accommodations that are spacious and comfortable at Bally’s. Pets are even welcome in selected rooms here. In the lobby, guests can easily take care of many needs, whether picking up tickets at the box office, making tour arrangements or asking the concierge for information on activities. At 67,000 square feet, the casino has all the offerings with countless slot and video poker machines and all your favorite table games. There is also a high-limit area, a stadium-style race and sports book, a poker room and a comfortable 24-hour keno parlor. Bally’s Avenue Shoppes, a retail area full of specialty stores, is located on the floor below the casino. Bally’s is also home to the Grand Bazaar Shops. This 2-acre outdoor complex with more than 100 retail outlets is located at the front of the property and inspired by great markets from around the world. It also features a 4,000-pound installation called the Swarovski Starburst,which drops every night at 9 p.m. and midnight during a three-minute sound and light show. Those looking to relax will enjoy The Spa at Bally’s, a salon, a state-of-the-art gym, eight championship tennis courts and a pool complex that includes an oversized heated pool, private cabanas and palm trees. With more than 175,000 square feet of meeting space, Bally’s is also the ideal location for business-minded visitors. There is valet and self-parking. Guests will be charged $10 per day for self-parking and $18 per day for valet parking. Hourly self-parking and valet rates vary. 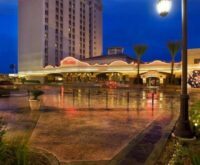 One of the city’s first major high-rise hotels, Bally’s still has all the comfort, classiness and fun that fabulous Vegas vacations require in a great central Strip location.